She’s never needed her team of zombie slayers more, but ultra bad-boy Cole Holland, the leader and her boyfriend, suddenly withdraws from her…from everyone. Now, with her best friend Kat at her side, Ali must kill the zombies, uncover Cole’s secret and learn to fight the darkness. First off. I had completely forgot what happened during the book I had to go look for a synopsis. I couldn’t find one. So here is hoping I can remember most of what happened. That’s how much it stuck with me. Ok. So from what I can remember, there was a big battle where Ali gets hurt. A lot. Like majorly. More then the car accident she could have LITERALLY walked away from. Anyways. After she has been bitten by the zombies quite a bit it turns out that it is slowly turning her into one. She starts to see the zombie Ali in mirrors. ZA(Zombie Ali) is growing stronger and stronger as each day goes by. And regular Ali is getting weaker in a sense… If that makes sense. She still has the will to to fight ZA to make her go away. Honestly I can’t remember a whole lot more from the book besides ZA continually getting stronger and her having to use the antidote to keep her at bay. As she uses it more and more she starts building a tolerance to the antidote it stops working really. Eventually, at the end of the book, they find a cure for it. And ta-da. She no longer has a Zombie growing inside her. There is other stuff that happens and I can’t remember a single thing. I said I was probably going to do all three books, but I am going to say nevermind on that. Because I don’t want to have to hurt my brain trying to figure out what had happened. 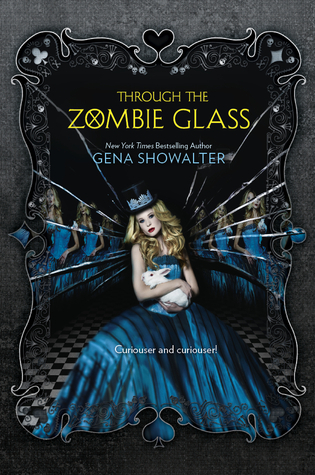 This entry was posted in Book Review and tagged alice in wonderland, book, book review, book reviewer, books, fake zombies, gena showalter, the white rabbit chronicles, through the zombie glass, white rabbit chronicles, wonderland, zombies. Bookmark the permalink.